A city can have all the culture, commerce, and sporting success in the world, but if it doesn't have a standout specialty burger chain, it is nothing but a fool's paradise. 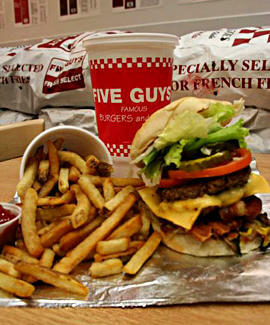 Here to fill Chicago's void, Five Guys Famous Burgers and Fries. Started in DC back in '86 by a Midwestern expat, this Eastern Seaboard standby's first Chi outpost is a retro eat-in/carryout serving up fresh, never frozen, hand-formed double patty beef burgers, plus hot dogs of the kosher and non-kosher varietals. Meat's load-uppable with 15 free toppings and condiments, including a trio of sauces (bbq, A-1, hot), sauteed 'shrooms, jalapeños, and fried onion strings, which're apparently not just for making green beans palatable on Thanksgiving anymore. Drink refills are also free, while sides options are two: monster servings of double-fried fries (Cajun seasoning optional), carved from potatoes stored in sacks on the floor; or heaping helpings of gratis peanuts whose shells you're encouraged to deposit on said floor, as people who sweep up burger franchises don't already lead a humiliating enough existence. For the less manly, FG's also offering "little" versions of its burgers with one patty instead of two -- though if you think that'll keep you from getting fat, Michael McDonald would be quick to point out that that's what a fool believes.